Address:135 Yuan-Tung Road, Chungli area, Taoyuan city, Taiwan, R.O.C. » Take a high-speed train to Taoyaun Station. Then take a taxi to YZU. A taxi ride takes about 20~30 minutes and its fair is about NT$300. » Either take a regular train directly to Nei-Li Station, or take an express train to Chung-Li Station (from South) or Taoyuan Station (from North). For the later option, you need to make a transfer to Nei-Li Station by local train. » From Nei-Li Station, walk out the station and turn right immediately. After a 150M walk, you will meet the first traffic lights. Here, keep straight ahead and continue your walk. After another 150M walk, you will meet the second traffic lights. At this intersection, you will see a sign of Yuan Ze University on a post. At this moment, turn right across the railroad. Continue your walk for 300M, the University gate will be on your left. The walk time is about 10 to 15 minutes. » Take Route 1 bus at Chung-Li or Taoyuan Main Station and get off at Yuan Ze University Station. This ride may take about 20 minutes. Then, look around and you will see a sign of Yuan Ze University on a post along the railways. Then, walk toward that post (just right beside some traffic lights) and turn right across the railroad. Continue your walk for 300M, the University gate will be on your right. The walk time is about 5 to 10 minutes. 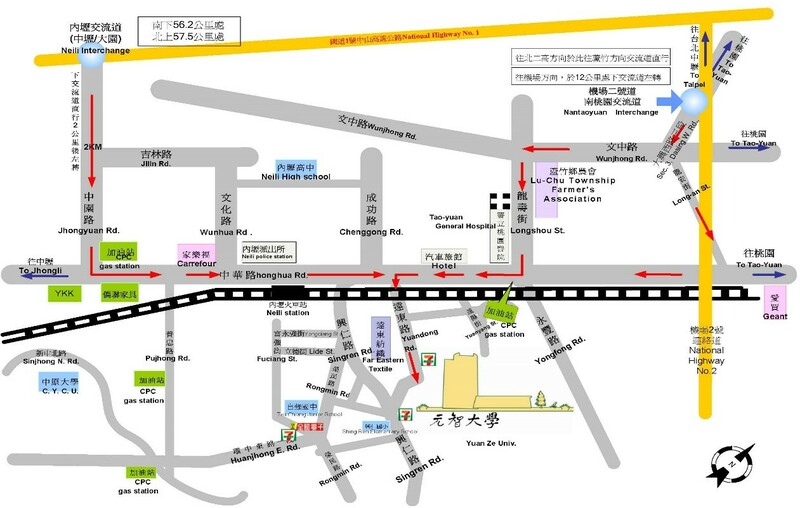 » Take Route 155 or 156 at Chung-Li Main Station directly to Yuan Ze University. The ride takes about 30~40 minutes. » From Taipei: Take Super Highway 1 southbound and then change to Super Highway 2 eastbound. Continue a 2-minute drive and exit at Southern Taoyuan Interchange toward Chung-Li (keep right) direction and connect to Sec. 3, Daxing W. Rd. After a 650m-drive on Sec. 3, Daxing W. Rd., you will meet some traffic lights. At this intersection, go straight ahead into Long'an St. for 900m and then turn right at Chung-Hwa Rd. Drive for 2.5km on Chung-Hwa RD. and then turn left at Yuan-Tung Rd. Shortly, YZU will be on the left. » From Hsinchu (South): Take Super Highway 1 northbound. Exit at Nei-Li Interchange toward Chung-Li (keep right) direction and get connected to Sec. 2, Zhongyuan Rd. Drive for 2.5km on Sec. 2, Zhongyuan Rd. and turn left at Sec. 2, Chung-Hwa Rd. Stay on Chung-Hwa Rd. for 2.7km, then turn right at Yuan-Tung Rd. Shortly, YZU will be on the left.